Your Automotive Locksmith Team. Choose Buffalo Key and Lock! 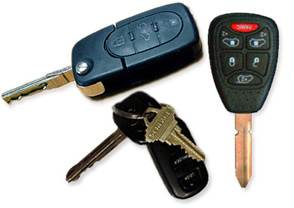 Why choose Buffalo Key and Lock? We are a small family owned business and take pride in keeping you and your valuables safe. We also specialize in automotive. Come and visit our padlock collection .In the historic city of North Tonawanda home of the carrousel museum. North Tonawanda, N.Y. (WKBW) - Ron Chase has quite a collection of locks. He says "I have a lot of locks and that grows everyday." but Ron is just being modest, he actually has loads and loads of locks. "There may be 1200 pieces in the cabinets, I may have over 60 thousand locks." according to the man who has been collecting theses since he was a kid. It's no surprise that after 40 years Ron has created a world class collection. It's also no surprise that the "kid collector" grew up to be a locksmith. Ron and his wife Lorelei own Buffalo Key and Lock in North Tonawanda. People who stop by their store to have keys made are instantly surrounded by Ron's incredible collection that fills several showcases in their shop. While there may be thousand of pieces here, Ron can tell you something about each one. He's writing a book about his collection, he says "locks and keys had a great purpose in our history." Many modern automobiles (especially the more expensive models) have keys with transponders hidden inside the plastic head of the key. The owner of the car may not even be aware that the transponder is there because there are no buttons to press. When a key is inserted into the ignition lock cylinder and turned, the car's computer sends a radio signal to the transponder. Unless the transponder replies with a valid code, the computer will not allow the engine to be started. "ONE CALL WILL PUT YOUR MIND AT EASE"
Serving Tonawanda, Buffalo, and Beyond. We specialize in automotive. Come and visit our padlock collection. In the historic city of North Tonawanda the home of the world famous carousel museum. We have the largest selection of older and newer keys in stock. If you need originals for newer and older vehicles we have them. Harley Davidson V-twin engine sculpted keys. PLEASE CALL ANYTIME WITH YOUR QUESTIONS.